2018 marks the 20th year of dreams coming true for Désirée, who turned “wedding-flower-designs-for-a-friend” gigs into a flourishing business. Désirée De Lara has been obsessed with color since childhood. A 4th generation San Franciscan with cultural roots in Mexico, Désirée credits her Mexican grandmother, Mima – who had a green thumb and gorgeous rose garden in East L.A. – for her flower passion. Raised in San Francisco’s Castro during the wild days of the 70’s, Désirée’s mother encouraged creative expression and a love of beauty, while her father – a small business owner himself – instilled humility, independence and entrepreneurship. After traveling the world and graduating from UC Santa Cruz, she went on to be a freelance flower designer for international event planners, including the renowned Stanlee Gatti, Colin Cowie and Oprah favorite Jeff Leatham. During this time, she was chosen as one of a few designers to visit Qatar and create wedding flowers for the Prince in the Emir’s palace. In addition, she has collaborated on design teams that created such high profile events as Oscar and SAG award ceremonies in Los Angeles. Today, she and her team continue to deliver in style, cruising through her beloved streets of San Francisco with flower creations in tow. Désirée enjoys being a mother, throwing gatherings in her Victorian home and working on her succulent garden. 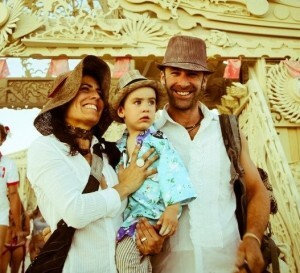 In between her mom-prenuer schedule, she manages a yearly stint to Burning Man with her husband. ©2018 Désirée De Lara. All Rights Reserved.